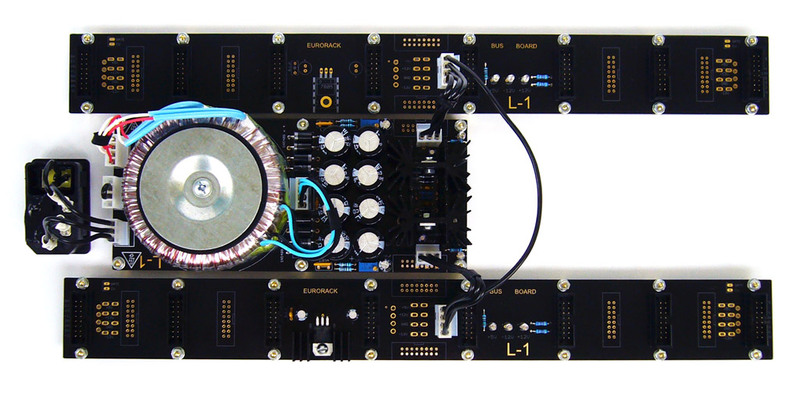 MUFF WIGGLER :: View topic - [IN STOCK] L-1 Power System. [IN STOCK] L-1 Power System. The power is ready. Works correct. 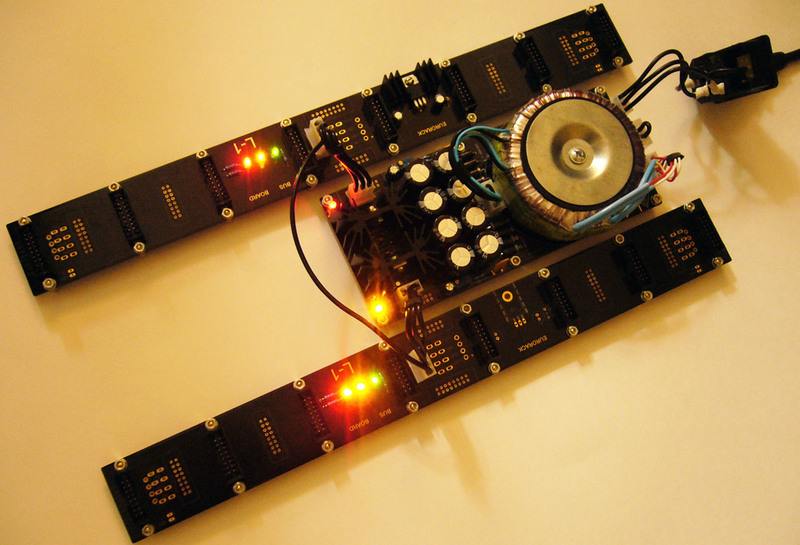 12V linear bipolar adjustable power system for Eurorack synthesizers. - 1.5A per rail maximum output without ripples and noise. - low voltage dropout under load. LDO regulators used. 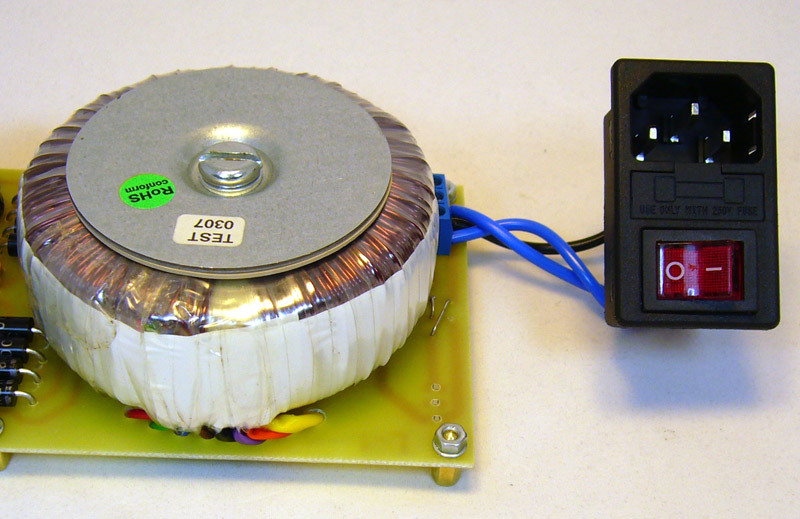 - less heat because 13.7V 60VA transformer used. - 2A fuse in the outlet. 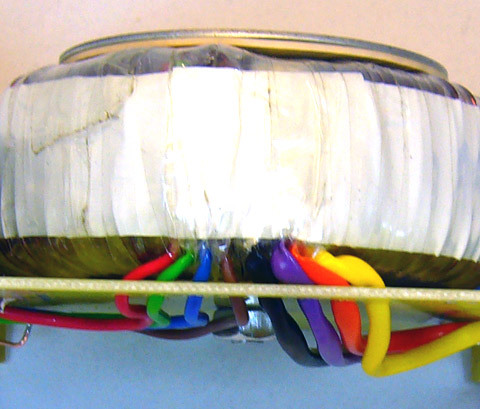 - 1.85A thermofuses after the transformer on each rail. 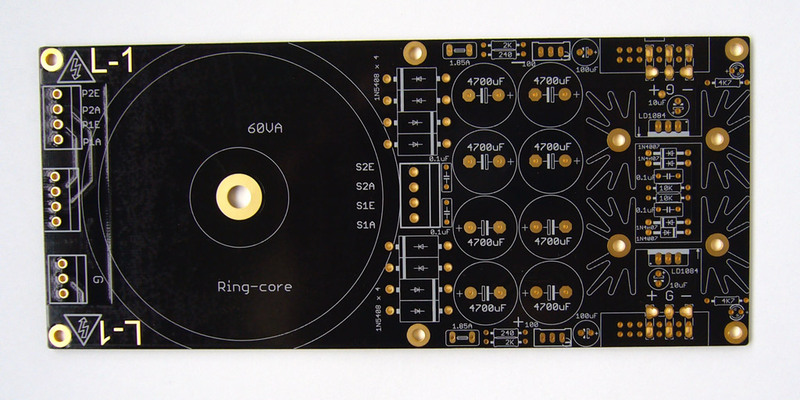 - PCBs are gold platted, 2mm thickness, maximum possible thick foil layer 105mkm. 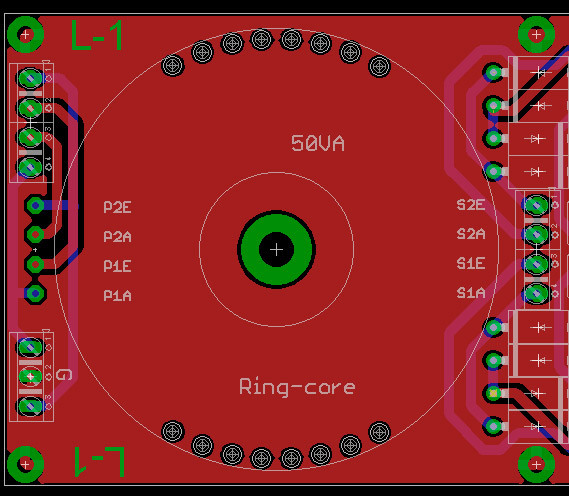 - two options: with 25mm height and 50mm height heatsinks. - all wiring on headers. Different types possible: MTA-156 (included), spades, with screws, IDE ribbons. 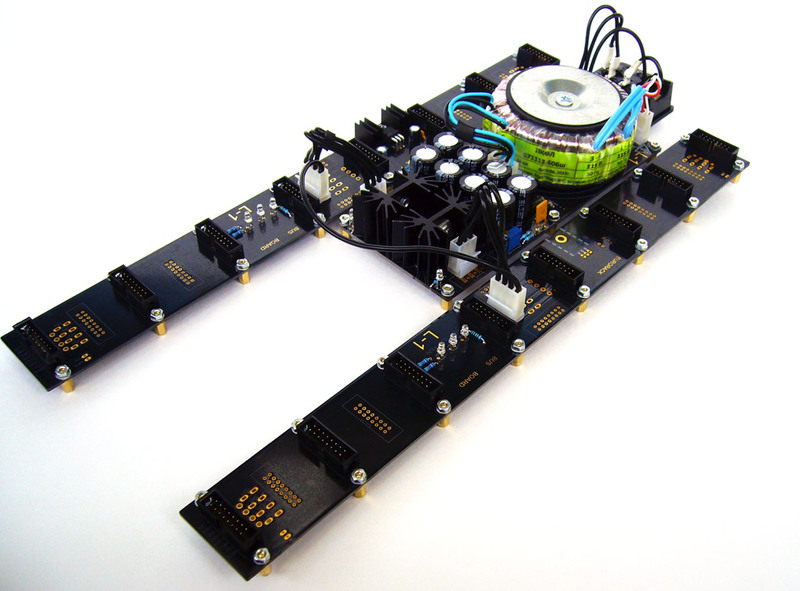 - 5V regulator on busboards. Full kits include everything for build as pictured. Full specification will post later. 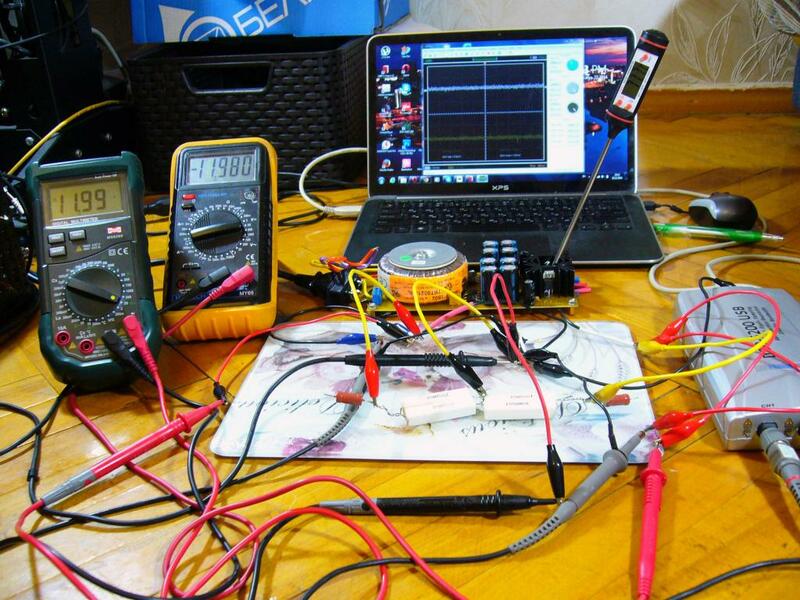 I tested the device with 15V 50VA transformer under 8 hours at 10 Ohm load (1.2A at the out). 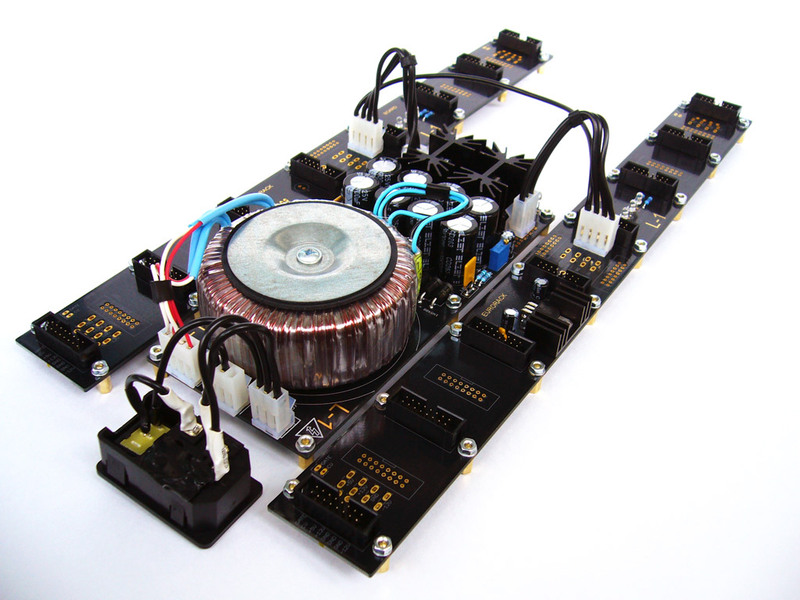 Room temperature was 25Ãƒâ€šÃ‚Â°C, heatsinks temperature was stable between 80-85Ãƒâ€šÃ‚Â°C. Regulators max working temperature is 125Ãƒâ€šÃ‚Â°C. Temperature with 13.5V transformer must be lower. But now I have on hands only 30VA one which easy holds 11 Ohm load without overloading, ripple and noise. Also I tested all PSUs I have. It's Cwejman, Doepfer and MFOS. The aim was to have better performance. I used DSO-5200 USB scope with battery powered notebook to have less internal noise. Is this dual input 120/240V ? I will not show my measurements of Doepfer and Cwejman PSUs. If somebody want can measure themselves. But I show my measurements of MFOS PSU which I built myself using MSOF schematic and board layout. PSU itself works veru good - very low noise and dropout but not enough power. It can't hold even 11 Ohm load, it's 1.05A at the out. 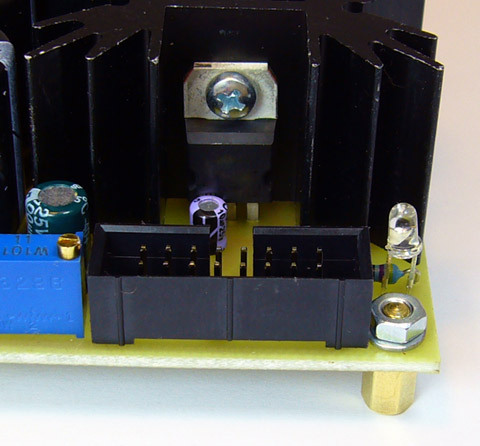 It what I see on all LM317 based PSUs I've checked. Looks nice, only thing that concerns me is the uncovered access to mains voltage, shouldn't there be some sort of metal case around the high voltage stuff? High voltage is isolated everywhere at top. Only at bottom side of the board it is unisolated. Danger! High voltage! Do not touch powered device! There are jumpers on the board for that. Nice project but I'm a bit concerned with the temperature. 85 degrees might be fine on the bench, but inside a full case with no airflow? Some external heat transfer (holes) or even a fan might be needed. 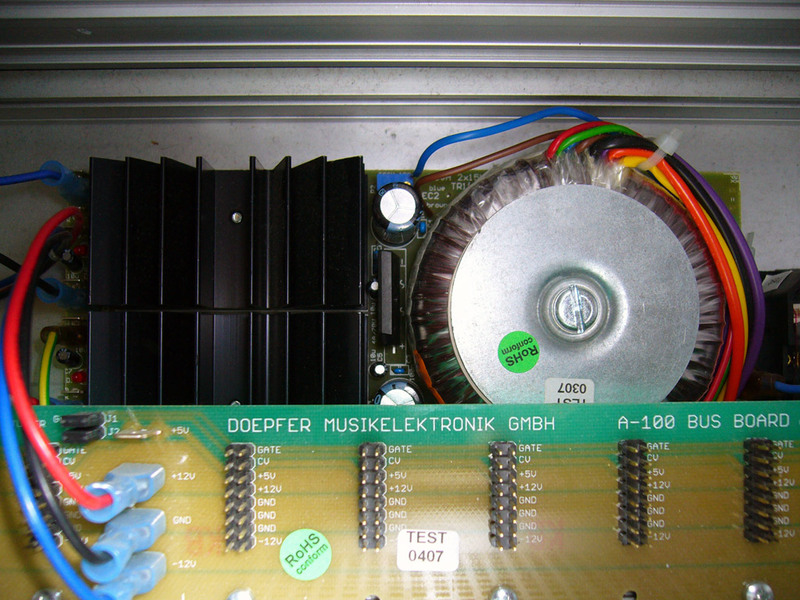 The Doepfer PSU2 has what looks like bigger heatsinks for the same current output. I'd also worry about the lifetime of capacitors in the vicinity of this temperature. I tried first. 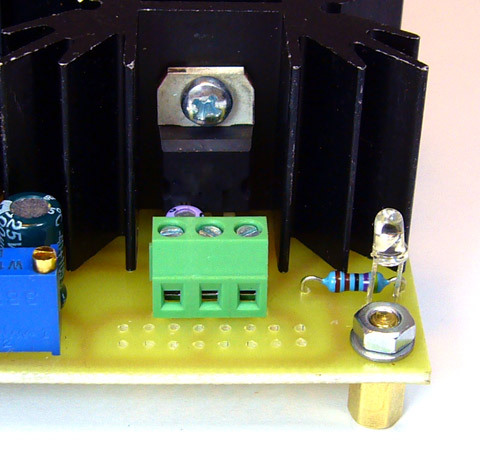 It worked with 13.5V transformer if to install tantalum caps and schottky diodes in bridge. These new ones don't need tantalums and work with regular diodes. Doepfer PSU 2 is it? It doesn't hold this 10 Ohm load. 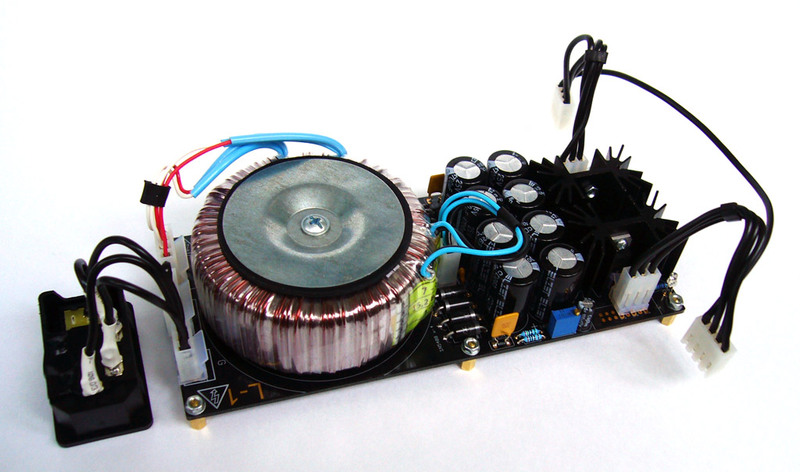 Working temperature of capacitors is up to 105Ãƒâ€šÃ‚Â°C and they doesn't heat up to 85Ãƒâ€šÃ‚Â°C like heatsinks. Also bigger heatsinks can be used for massive load. Next high with this footprint is 36mm. 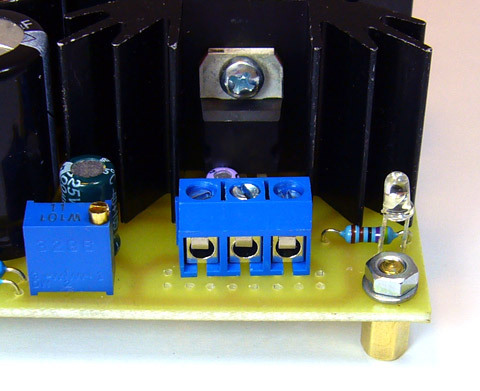 These measurements were with 15V transformer. I'm going to supply with 13.5V one. Power dissipation with 13.5V one will be much lower. Now I have only 30VA, so can't check it with big load. 11Ohm or 1.05A at the out is what this 30VA holds. Okay Interested in the new measurements with a lower input voltage. Also if you can check the working temperature inside a wooden box. 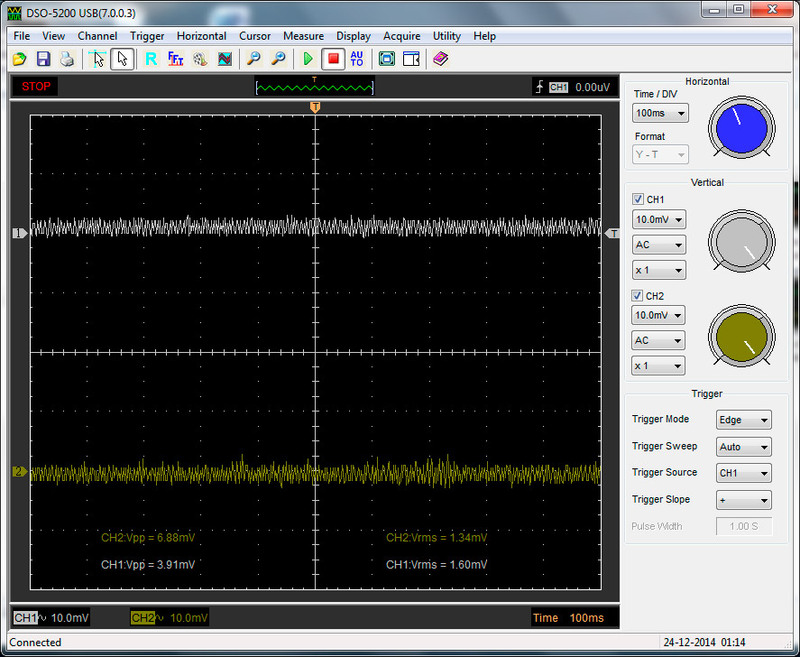 I measured with 30VA 13.5V transformer under 11Ohm load or 1.05A at the out. This is what I had on this Doepfer PSU under this 11Ohm load. V+ about 10.5V flows, V- about - 10.4V flows. It is with big 50VA transformer. Are you selling this as a DIY kit, and not a finished product, to avoid safety certification and to ensure your small Business doesn't need product liability insurance? This is the third DIY Power supply, along with Erica Synths and J3RK's, that would Bankrupt a small business owner in Australia & New Zealand pretty quickly, for failing to get the mandatory safety approval for an electrical product. Any Synth-Distributor selling these in Australia or New Zealand would also be fined. OK, I re-routed transformers pins. Now PTR-500 connectors are possible. Don't see any more differeces between mine and Doepfer's. Transformers ins made there on spades, outs are soldered to board. Alex, thanks for posting these measurements. There have been a couple of other PSU projects announced recently, I asked whether the announced current rating was nominal, peak or steady and got evasive answers. Asked what the ripple was at 80% load and got zero answers. So you posted my answers without my having to ask! In summary, the 15V/50VA provides a steady-state 1.5A. It remains in regulation, as you showed, at 0% 40% 73% 80% and 100% of rated load. Voltage stayed constant (worst case was -11.975 on full load compared to -12.000V unloaded) and ripple stayed close to the baseline scope measurement at below 2mV rms. That is a great result! I share the concern about 85Ãƒâ€šÃ‚Â°C in free air being a bit high; you also gave a result for a 13.5V/30A (so, 1.1A steady if the 13.5/60VA is rated 2.2A steady) with a more reasonable 48.5Ãƒâ€šÃ‚Â°C in free air. (It will be higher inside a case). You also demonstrated the futility of rules of thumb like "80% load will be fine". The MFOS nominal 1.5A supply dropping out of regulation somewhere between 40% and 73% load and the Doepfer PSU2 nominal 1.2A dropping out somewhere below 91% (difficult to say much from a single measurement). I'm glad you didn't go the marketingese route (3A nominal, and that is on both rails so hey, buy the L-1 6A power supply!!!!) but instead went for solid measured results. Other companies offering power supplies could usefully do the same measurements on their own stuff (unless they are knowingly selling tech with poor results, of course). There are aspects of the design I don't like. The 120V/240V jumpers use uninsulated wire. That seems dangerous. I would have prefered to see an insulated rotary switch on the inlet, or insulated links on the PCB. Ribbon cable seems a poor choice for bus to PSU connection (but I see you also offer a screw terminal option). 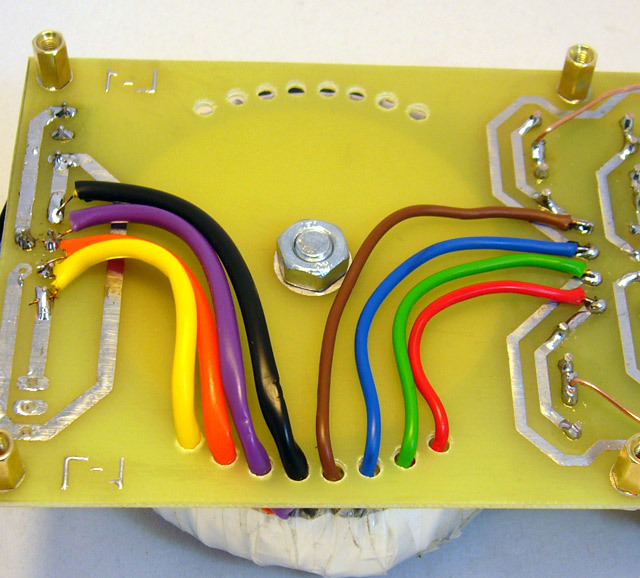 I would have preferred to see multiple spade/faston connections for the +12V, 0V, and -12V outputs. Otherwise people are tempted to daisy-chain from one busboard to another. 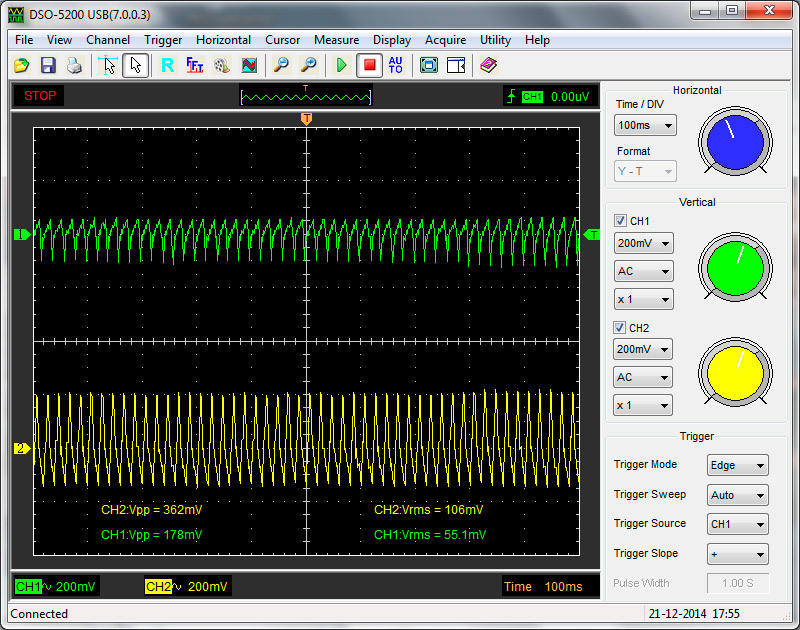 The 0V return needs to be low impedance. And I would have expected larger heatsinks (but like your approach of measuring temperature rise rather than guessing/hoping). I see you plan to use a 13.5V/60VA transformer to give a constant-load 2.2A supply, with lower heat dissipation due to dropping less voltage in the regulators. That seems a good approach, provided regulation and ripple is as good as your earlier results. I look forward to seeing the measurements when you have the new transformer available. You fixed that while I was posting!